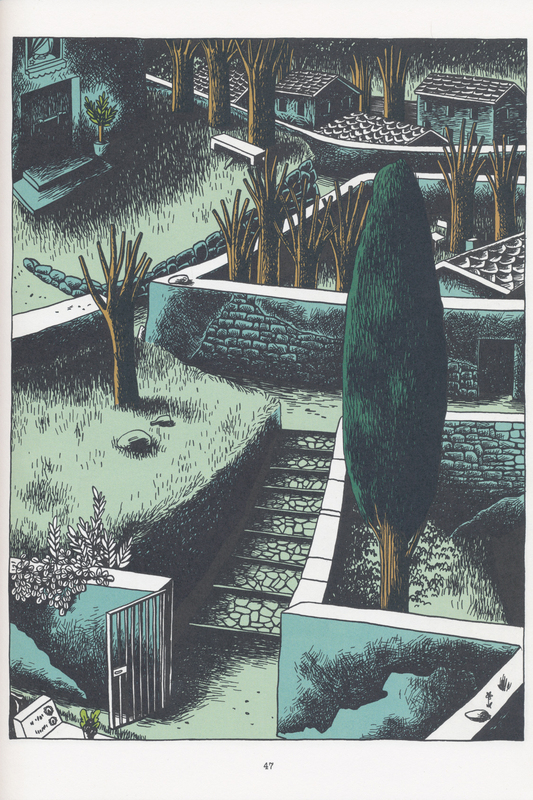 Souvenir: Gabriella Giandelli’s Sous Les Feuilles | Comics Vacation! I stumbled upon this book in a Montreal bookstore a few years ago. Then unfamiliar with her work, I felt that I should buy it solely on the premise that it was about a man wandering a strange, new place—the exact situation I was in at the time. The moods of Gabriella Giandelli’s stories are very much built on the places they inhabit. It seems important to her that these stories—in order to last, to remain timeless—occur in places removed from any specific time period. 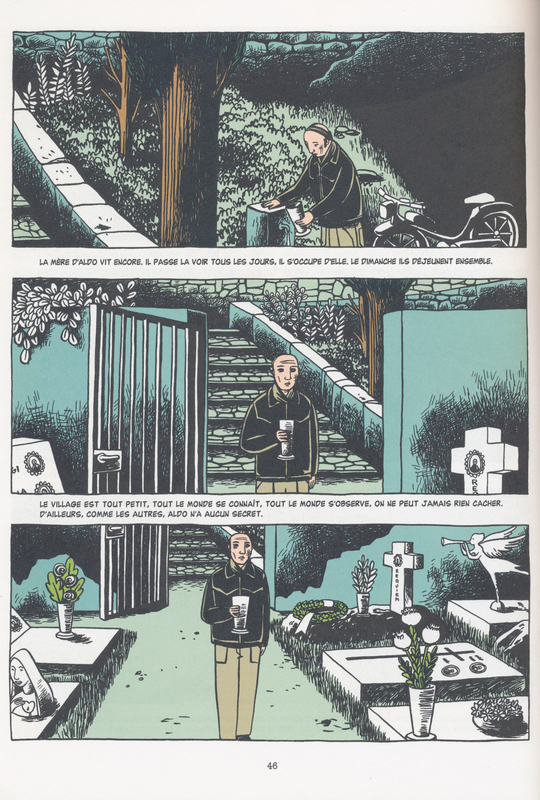 By making them so, she is able to add an additional layer to what is already a haunting atmosphere; in books like Sous Les Feuilles (Seuil) and Interiorae (Fantagraphics Books), the reader is often left feeling disoriented. Part of the allure of these places and stories is discovering what they are all about. Sous Les Feuilles seems to exist not in a place where time has stopped, but a place where it is irrelevant. The characters seem lost, but at home. The architecture, decor, and clothing seem vaguely twentieth century, but there is nothing to identify them as such. 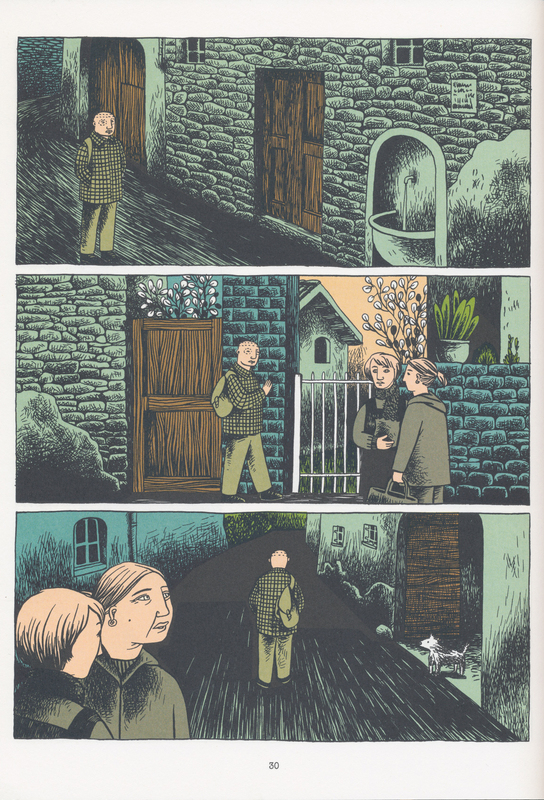 These elements are evocative of a parallel universe; the village is sparsely populated, inducing a feeling of purgatory. The infrastructure is cold, yet cared for. This is not a place abandoned and without love. The village is densely structured, but where are all the people? The world is insulated and self-contained; in many of the scenes within the village, the sky is ommited, hinting at the fact that there might not be a world beyond this. Even those parts of the story that take place in the surrounding forest are so deeply enshrouded by foliage that the same remains true there. It takes a special skill to construct a world so closely resembling our own, yet wholly different. Gabriella Giandelli’s worlds are just familiar enough for the reader to get comfortable, but eerie enough that you wonder if you were ever there at all.